This time the spotlight will be shining on ROM: Read Only Memories, a cyberpunk adventure in Neo San Francisco; a city where danger looms around every corner. Let’s see if we can’t help it escape the cold emptiness of Greenlight limbo, eh? Read Only Memories is all about exploration and puzzle solving. The deeper you dive into the mystery of your missing friend and this new unknown ROM, the further you get entangled into the deepest scandal to ever hit Neo San Francisco. In a city packed with danger, and filled with Hybrids, Humans, ROMs and Brain Controlled Androids, the question is: Can you survive in Neo-SF? 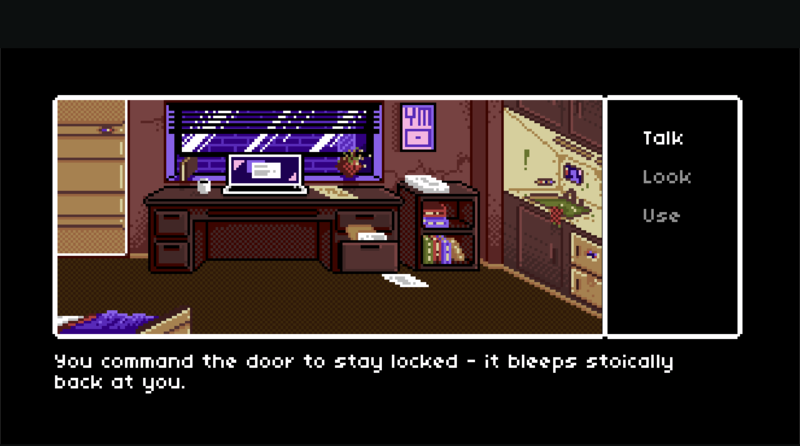 Feels like forever since I played an adventure game – point ‘n’ click or not – with such an old-school interface. Some might say that’s for the best, but in the case of ROM: Read Only Memories, I’d say the dated design is part of the appeal. We are after all talking about a cyberpunk adventure in Neo San Francisco here, and not some post-modern sci-fi (which is totally a thing, by the way). So… a missing friend, in a city full of androids, humans and of course, hybrids, because, cyberpunk. I’d be very surprised if the game doesn’t pack a conspiracy theory or two, along with a witty sideki– oh, there he is. Right there in the trailer below, which you should totally watch. So riddle me this, dear reader: why is ROM: Read Only Memories still struggling to get through Greenlight? It’s not out just yet, but should be at some point, this fall! As such, might I recommend visiting its Greenlight page and handing over a ‘yes’, if you like what you see? Remember: your vote matters!